Proves why a resistive screen with Android is a recipe for disaster. Dirt cheap; Excellent 1080p playback. Bulky; Buggy software; Resistive touchscreen is terrible; Medicore battery life. 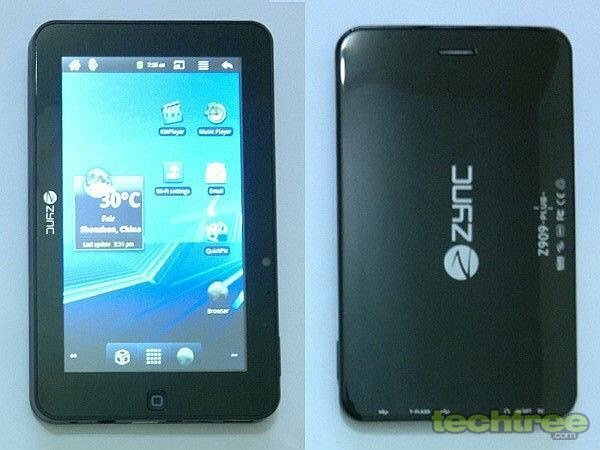 If you're looking for an ultra-cheap tablet, you just can't ignore Zync's Z909 Plus. Considering that the government-funded Aakash still hasn't seen the light of day, the Z909 Plus is probably the cheapest Android tablet officially available in India. Despite the low cost though, it packs in a decent 1 GHz CPU. Is it really a good deal as a whole? Let's find out. The retail package includes the tablet, charger, USB cable, earphones, and a pouch. The slate measures 7.6" (l) x 4.6" (w) x 0.6" (14 mm) (d), and weighs 380 grammes. The device is one of the cheapest tablets in the market, and looks and feels like it. Not only is the design uninspiring, it's also the thickest tablet I've come across (but not by much). The only saving grace is that the slate doesn't make a creaking sound when pressed. 1 GHz CPU, 256 MB DDR3 RAM. Android 2.3 (Gingerbread) with Google Play. 7" resistive, 2-point multi-touch screen (800x480). Wi-Fi, Full-sized USB 2.0 port with external 3G dongle support, Mini-USB 2.0 port. Dongles Supported - Huawei: E220, E230, E169G, E160X, E173, W8, E 153, 1550, 1732; WCDMA: Huawei E261, E1750, ZTE MF100, MF190; TD-SCDMA: Huawei ET302, ZTE A356, MU351; CDMA: Huawei EC122, EC156, ZTE AC2736, AC2746, ITON eu83. Front 0.3 mp camera, Orientation sensor. Supported Media Formats: MP4, MPEG, MP3, WAV, WMA. 3000 mAh Lithium-ion polymer battery. The Z909 Plus runs Android 2.3 (Gingerbread), and despite being powered by a 1 GHz CPU, lags terribly. Quite often, the resistive screen refuses to even register a touch. If this wasn't bad enough, the onboard software is unstable to boot. The combined effect of these factors makes this tablet absolutely frustrating to use. If a decent Android experience is important to you, stop reading this review right here. Those who think they can put up with a lagfest may continue reading. Check out the image gallery at the bottom for additional UI screens. The tablet comes pre-installed with many apps, including Yahoo! Messenger, MSN Messenger, LinkedIn, Opera Mobile, and Talking Tom. All of these apps are freely available in the Play store, but having them preloaded saves you some time and data. Like every other entry-level tablet, this one too packs in a front-facing VGA camera to allow video chat over Wi-Fi. Finally, the Z909 Plus also supports selected 3G dongles via its full-sized USB 2.0 port. As expected, Zync has bundled a pair of poor-quality IEMs (In-Ear Monitors). The gadget's sound quality is bad, and even a good pair of aftermarket IEMs can't salvage it. In a personal gripe, the music player lacks equaliser settings. Even though the specs claim the presence of "stereo speakers", the fact of the matter is that only a single speaker is present, thus making the stereo effect nonexistent. Those who don't care about audio quality though will be pleased with its excessively loud output. On the plus side, the product has a very good video player. It had no issues at all even when playing 1080p MP4, DivX, and XviD clips. The slate packs in a 3000 mAh Lithium polymer battery that lasts for only 3 hours under moderate use. With continuous video playback, it hardly lasts for more than a hour. Basically, you can't even watch a movie on a single charge. For around Rs 3400, the Z909 Plus might sound like a great deal. However, its resistive screen and performance are so bad that it can't even justify its dirt-cheap pricing. It makes more sense to stretch your budget by a few thousands and go for the NXG Xtab A10 instead, or pick one from the top tablets under Rs 7000.